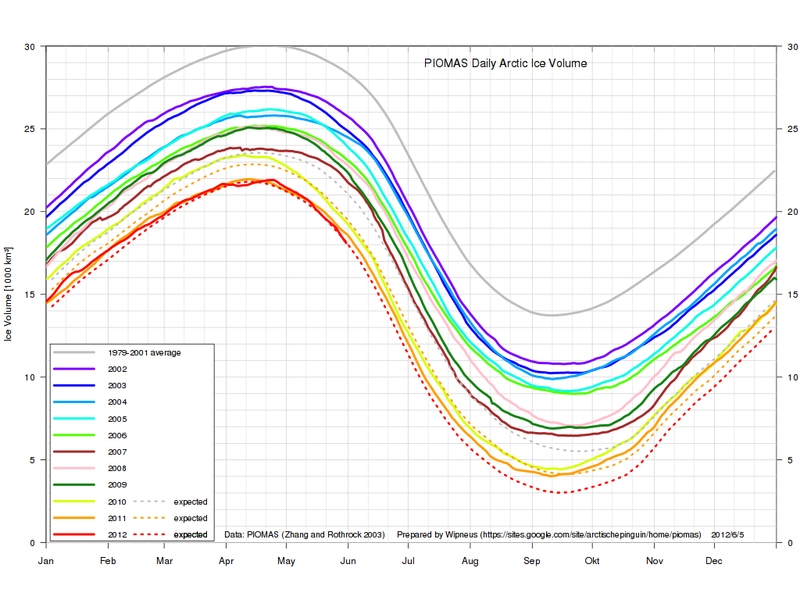 The image below shows recent data on Arctic sea ice volume, as calculated using the Pan-Arctic Ice Ocean Modeling and Assimilation System (PIOMAS, Zhang and Rothrock, 2003) developed at the Polar Science Center, Applied Physics Laboratory, University of Washington. As shown on the images below, by Wipneus and earlier published at the Arctic Sea Ice Blog, sea ice volume loss is on track to reach a minimum of 3000 cubic kilometers this summer. 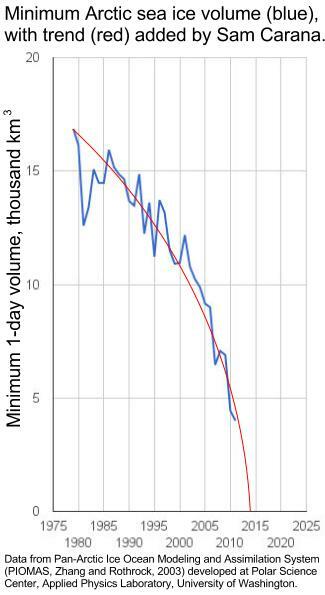 The recent sea ice volume is in line with the exponential trend calculated by Wipneus that is pointing at zero ice volume around 2015 (image below). As described in an earlier post, I believe that a trendline pointing at 2014 fits the data best (image left). As discussed, some ice may persist close to Greenland for a few years more, since Greenland constitutes a barrier that holds the sea ice in place. Similarly, natural variability could prolong the ice longer than expected. However, such arguments offer no reason to rule out an imminent collapse of the sea ice, since natural variability works both ways, it could bring about such a collapse either earlier or later than models indicate. In fact, the thinner the sea ice gets, the more likely an early collapse is to occur. There is robust evidence that global warming will increase the intensity of extreme weather events, so more heavy winds and more intense storms can be expected to increasingly break up the remaining ice in future, driving the smaller parts out of the Arctic Ocean more easily. Much of the sea ice loss already occurs due to sea ice moving along the edges of Greenland into the Atlantic Ocean. Could you think of any reason why Arctic sea ice would NOT collapse in 2014? can you say anything about the current and predicted atmospheric oxygen levels, Sam? ever heard of an S-curve? A logistic curve or sigmoid curve could be drawn, which would fit data that show "S-shaped" type of behavior. However, for an S-shaped curve to be applicable, there must be a reason for the curve to go the other way at some stage. As the post discusses, heavy winds and more intense storms could break up the ice and drive it out of the Arctic Ocean, which would speed up, rather than slow down the loss of sea ice in the Arctic. In that case, a logarithmic trend would be more appropriate. Wipneus did add a logarithmic trend at a graph with different projections, and it points at 2013 and actually appears to fit observed data very well, making my graph that points at 2014 look rather conservative. I think 2013 looks increasingly probable, though there are some thick ice behind Greenland. As of 12 June the sea ice area loss is already nearing 2 million km2 around the Arctic Basin while many peripherial areas are still ice covered, like the Baffin Bay and the Hudson Bay ensuring almost certain new record sea ice loss in 2012. 5 metre sea ice behind Greenland will take some time to melt. Any reason why the University of Washington team is using a linear model instead of the model you have used? Do they have a reason for not using this apparently better fitting model? I see no valid reason for the University of Washington to downplay the situation. We all accept that sea ice is piling up north of Greenland where it is likely to persist for longer than elsewhere in the Arctic Ocean, but this doesn't change the trend toward a virtually ice-free Arctic Ocean within a few years time. It's no reason to apply a sigmoid curve to extrapolations for the entire Arctic Ocean, since the local situation north of Greenland doesn't apply to the rest of the Arctic Ocean. Have they commented this themselves ? I tried to check their site but may have missed that discussion. I am sure it has to be somewhere. 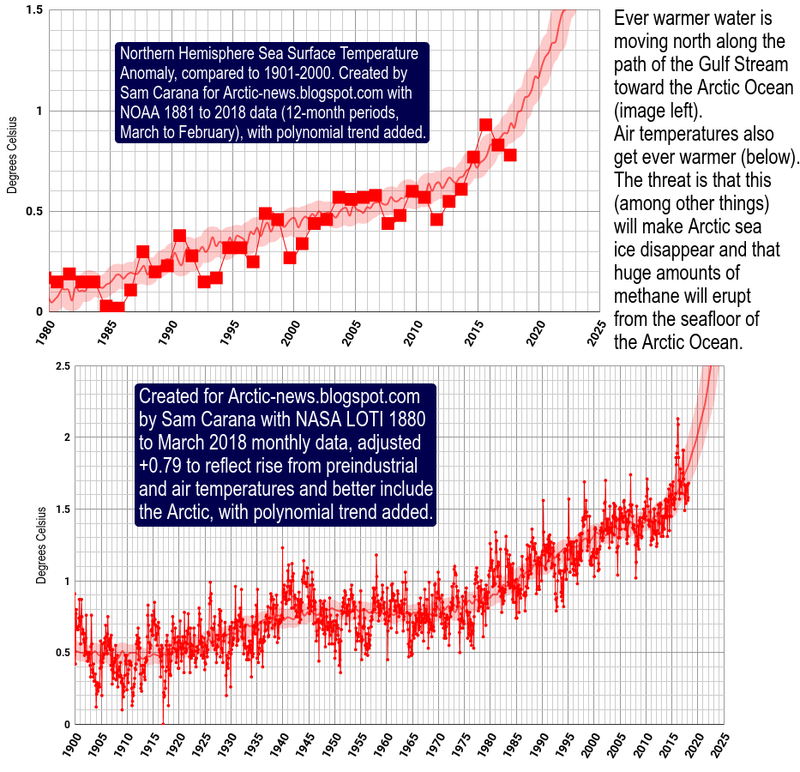 The use of exponential and other graphs to extrapolate from PIOMAS data has been discussed at places such as RealClimate.org and the Arctic Sea Ice blog, but I've not seen valid arguments to reject trends that point at a virtually ice-free Arctic Ocean within a few years. I asked Jinlun Zhang about their model and got this link http://psc.apl.washington.edu/zhang/Pubs/Zhang_etal_2010GL044988.pdf. While trying to get my head around it I would love to hear your comments. Do you see a flaw which invalidates their thinking? I believe they have more in their paper than simply fitting a curve and extrapolating. One often-repeated argument is that recent minimum volumes were deviations from some kind of "equilibrium" that the ice would restore to in the absence of such "natural variability". However, in lack of some magical insight as to where this "equilibrium" was, it makes sense to accept the reality of the minimum volume data as calculated by PIOMAS. 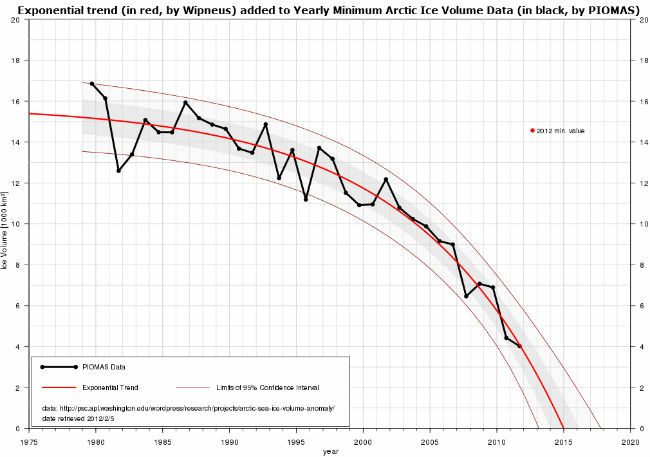 Natural variability works both ways, it could cause less decline (temporarily), or it could cause even more rapid decline, in which case we could witness a virtually ice-free Arctic Ocean even earlier than the best-fitting trend indicates. So, no reason to downplay the danger, but the more reason to alert the world about this eventuality. Another argument is that, as sea ice gets thinner, less ice would flow out of the Arctic Ocean into the Atlantic Ocean. However, much sea ice is already piling up north of Greenland and, with more open water, storms can be expected to increase in intensity and frequency, which could cause a virtual collapse in sea ice across the Arctic Ocean, with the remaining ice moving even more rapidly along to edges of Greenland into the Atlantic Ocean. 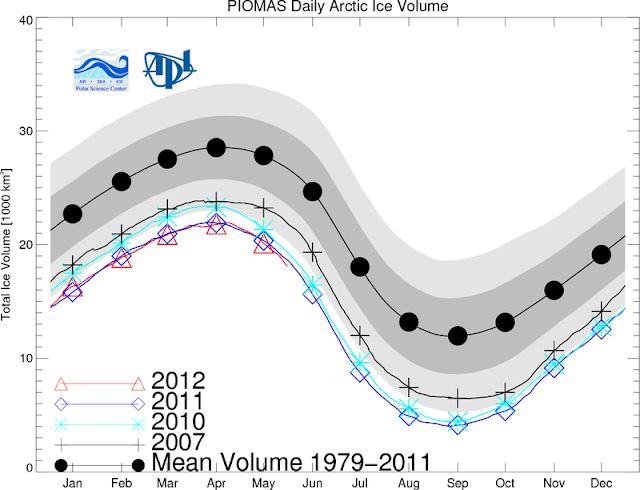 Again, rather than downplaying the danger, the fact that the ice gets thinner constitutes a reason to alert the world. There's enough reason to be alarmed, so why focus on arguments to downplay the situation? When firefighters receive an alert about a looming danger, they don't respond by saying that the odds of a building catching fire are low. No, they will act, in full force, as they should. 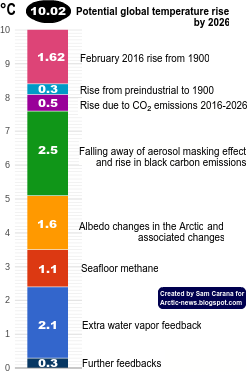 By comparison, much more than a single building is at stake in case of collapse of sea ice in the Arctic Ocean. Good points. And I certainly do not want to downplay the risk. Simply trying to understand the thinking behind a model which seems to deviate substantially with recent observations. Thanks, Juha, your comments are much appreciated. Have a look at the recent post on the potential for methane releases, which is just terrifying. We should look at ways to reduce these risks. Have a look at my presentation on why we should act now, and how. How much methane is located in the Arctic? Why act now, and how?